We assemble a versatile molecular scaffold from simple building blocks to create binary and multiplexed stable isotope reagents for quantitative mass spectrometry. Termed Protected Amine Labels (PAL), these reagents offer multiple analytical figures of merit including, (1) robust targeting of peptide N-termini and lysyl side chains, (2) optimal mass spectrometry ionization efficiency through regeneration of primary amines on labeled peptides, (3) an amino acid-based mass tag that incorporates heavy isotopes of carbon, nitrogen, and oxygen to ensure matched physicochemical and MS/MS fragmentation behavior among labeled peptides, and (4) a molecularly efficient architecture, in which the majority of hetero-atom centers can be used to synthesize a variety of nominal mass and sub-Da isotopologue stable isotope reagents. We demonstrate the performance of these reagents in well-established strategies whereby up to four channels of peptide isotopomers, each separated by 4 Da, are quantified in MS-level scans with accuracies comparable to current commercial reagents. In addition, we utilize the PAL scaffold to create isotopologue reagents in which labeled peptide analogs differ in mass based on the binding energy in carbon and nitrogen nuclei, thereby allowing quantification based on MS or MS/MS spectra. We demonstrate accurate quantification for reagents that support 6-plex labeling and propose extension of this scheme to 9-channels based on a similar PAL scaffold. 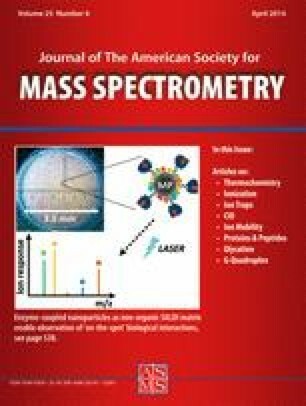 Finally, we provide exemplar data that extend the application of isotopologe-based quantification reagents to medium resolution, quadrupole time-of-flight mass spectrometers. Scott B. Ficarro and Jessica M. Biagi contributed equally to this work. The online version of this article (doi: 10.1007/s13361-013-0811-x) contains supplementary material, which is available to authorized users. The authors thank Dr. Michael Senko at ThermoFisher Scientific for providing modified ITCL code and guidance to enable acquisition of extended length time domain transients with the Orbitrap XL instrument. Generous financial support for this work was provided by the Susan Smith Center for Women’s Cancers and the Strategic Research Initiative at the Dana-Farber Cancer Institute, in addition to the National Institutes of Health, P01NS047572 (to J.A.M.) and HG006097-03 (to N.S.G). This work was also supported by the National Science Foundation Division of Materials Research through DMR-11-57490 (to A.G.M) and the State of Florida.